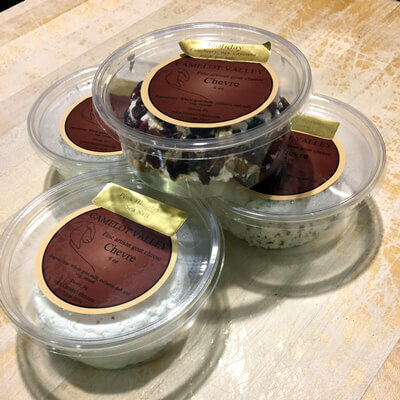 CHÈVRE IS BACK just in time for Valentine’s Day! Also on the cheese front, this week we debut Keswick Creamery’s rendition of Taleggio — the Stinky Elf washed with Troeg’s Mad Elf beer. Fresh bread from Talking Breads on Thursday; McGrath’s as usual on Friday and Saturday, with baguettes fresh on Saturday. Still on sale: eggs and butter! Also: cremini mushrooms, because I accidentally over-ordered. We have a lot of mushrooms. I just had to delete the first sentence I wrote because it said, “Dusty and I are not big celebrators of Valentine’s Day” — and then I started thinking about all the wonderful mid-February meals he’s treated me to over the past seven years. To be sure, there have been some V Days that involved nothing special whatsoever, but it would certainly not be fair to Dusty to say that it’s a non-holiday for us. But what I was going to say after asserting that V Day wasn’t a big one for us, is that we are pretty much always up for an excuse to make (or go out for) a special meal, and Valentine’s Day is very good for that. We’ve had some stand-out romantic meals at Philadelphia’s (now defunct, I’m sad to say) Il Pittore, and Harrisburg’s always wonderful Mangia Qui. This year, though, I think we’re going to stay home. I’m dreaming about a little indoor picnic in front of the woodstove — blanket on the floor, a warm baguette, probably an assortment of cheeses (chèvre, obviously, and maybe a side-by-side comparison of Keswick’s Stinky Elf and the authentic Taleggio from Hummer’s), some Sweet Farm Almost Sour pickles, maybe some Roasted Balsamic Radicchio, maybe some kind of baby mizuna salad, maybe with roasted beets or feta or apples, or maybe with a lemon mustard vinaigrette or even just Chef Tim’s for simplicity. Maybe with some bite-sized sausages, or maybe even some of the new cured meats from Hummer’s. A bottle of wine, of course, and a quiet evening of nibbling and just hanging out. Of course we won’t fault you if you want to go a little more formal than a blanket on the floor, and the market can help with that, too. We’ve got some beautiful bone-in steaks from the most recent round of JuJo Beef, lots of mushrooms (did I mention that? ), quail eggs!, and so much more. And of course of course we think all these things taste just as good whether eaten in romance, in friendship, in familial love, or just while binge-watching Jane the Virgin (or whatever). If Valentine’s Day is about celebrating love, celebrate your love for good food (if nothing else).